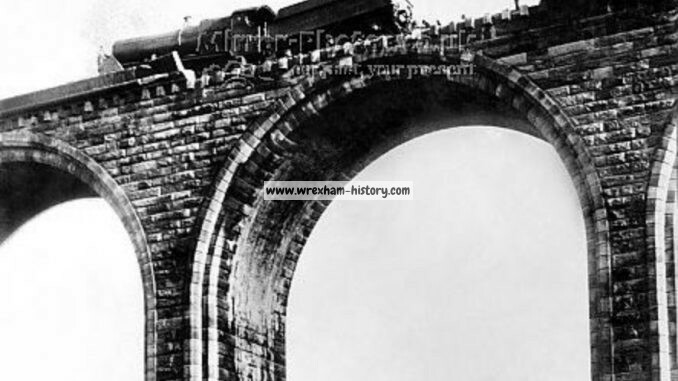 The result of the Inquiry into the circumstances of the accident which occurred at about 4.05 a.m. on 25th January 1928 on the Cefn Viaduct, between Chirk and Ruabon, on the Shrewsbury – Chester line of the Great Western Railway. Ministry of Transport, 7, Whitehall Gardens, London, S.W.1: 14th March, 1928. I have the honour to report, for the information of the Minister of Transport, in accordance with the Order of the 7th February, the result of my Inquiry into the circumstances of the accident which occurred at about 4.05 a.m. on 25th January 1928 on the Cefn Viaduct, between Chirk and Ruabon, on the Shrewsbury – Chester line of the Great Western Railway. 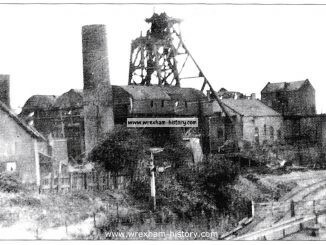 The 3.30 a.m. goods train – Oswestry to Birkenhead came to a stand on the viaduct owing to engine failure and while standing there the 12.45 a.m. goods train—Oxley sidings (Wolverhampton) to Birkenhead ran into the rear of the standing train. The 3.30 a.m. train from Oswestry consisted of 26 unfitted wagons, total weight approximately 210 tons, drawn by engine No. 2386, type 0-6-0 with 6-wheeled tender, weighing 67 tons in working order. It was fitted with the steam brake on the coupled and tender wheels and hand brake on the tender wheels. The 12.45 a.m. train from Oxley sidings consisted of 47 wagons, of which the leading 7 were vacuum fitted, total weight approximately 400 tons, drawn by engine No. 6389, type 2-6-0, with 6-wheeled tender, weighing 102 tons in working order. This engine was fitted with vacuum brake on the coupled wheels and tender wheels and hand brake on the tender wheels. The guard of the leading train suffered various injuries and burns, and the driver of the leading train and the guard of the following train also suffered minor injuries and shock. The driver and fireman of the following train suffered from shock. The engine and tender of the following train were derailed all wheels and considerably damaged, and the three leading wagons were derailed. Five wagons of the leading train were completely wrecked, and the guard’s van and some of these wagons caught fire. 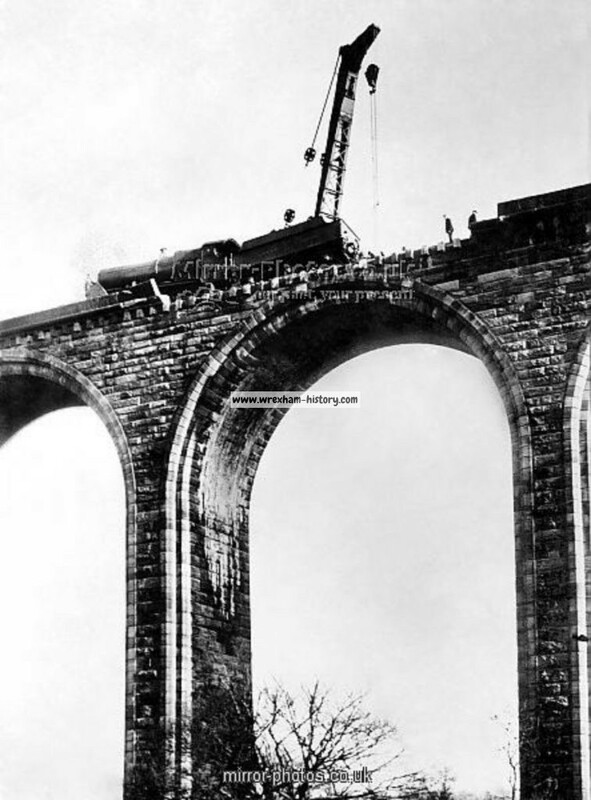 One hundred and sixty-two feet of permanent way was broken up and two lengths of the stone parapet of the viaduct (35 feet and 75 feet respectively) were displaced on the down side, together with a length of 20 feet on the up side. Both lines were blocked for some fourteen hours. The night was dark with a high wind. The Cefn viaduct is a brick and masonry structure of 19 arches carrying a double line of rail across the valley of the Dee, the total length between the ends of parapet walls being approximately 500 yards, and the height of the centre spars being about 120 feet. The width between parapet walls is 25 feet 8 inches and the top of the parapet is 3 feet 3 inches above rail level. The stones of the parapet vary in length from 3 feet to 5 feet. They are 12 inches thick at the top and 14 1/2 inches at the bottom and 3 feet high, weighing from 12 to 20 cwt each. Below the parapet is a string course of stones varying in length from 2 feet 9 inches to 5 feet 6 inches and 3 feet 6 inches wide by 1 foot 6 inches deep. Each rail is thus about 3 inches below the top of the string course and the top of the ballast at the sides just covers the bottom joint of the string course. A number of the stones of the string course were displaced and for practically the whole of the three lengths specified above, the stones of the parapet were displaced and thrown into the valley below. The track consists of British Standard 95 lb. rails, laid in 1927 and there are check rails on the inner rail of each track which are laid level with the running rails and spaced 1 3/4 inches therefrom. These check rails commence some 24 yards outside the ends of the parapet walls. The viaduct lies south-east and north-west and trains from the south-east approach over a falling gradient mostly at 1 in 143 from about mile 191, past Black Park signal-box to a point some 140 yards beyond Whitehurst Station, mile 194. Thereafter there is a level stretch of about 590 yards, leading to a further falling gradient of 440 yards at 1 in 125 to the commencement of the viaduct at 194 mile-1,170 yards. From this point the line rises at 1 in 117 across the viaduct and thereafter at 1 in 83 through Cefn for about 1 1/4 miles towards Llangollen Line Junction signal-box at 196 miles 700 yards and Ruabon. The signal boxes in operation at the time were Black Park and Llangollen Line Junction, those at Whitehurst, Fron Branch Junction, and Cefn being switched out. Approaching Fron Branch Junction box from the south-east the line is in cutting and curve, and it is only after passing under a bridge adjoining this box that the viaduct comes into view. Fron Branch Junction Box (closed) 2,508 Yards North. South end of viaduct 2,638 Yards North. Probable point of collision 2,793 Yards North. Point where engine of following train came to rest 2,883 Yards North. North end of viaduct 3,147 Yards North. Cefn Signal-box (closed) 3,960 Yards North. Llangollen Line Junction Box 5,687 Yards North. Driver Johnson of the leading (Oswestry) train noticed as the train approached the viaduct that the engine was working irregularly, and in view of the steep gradient ahead and the catch points thereon he allowed his train to come to a standstill on the viaduct to see what was wrong. He examined the valve gear and found that the cotter securing the right-hand valve spindle was missing. He decided to attempt to make an improvised repair and by this time guard Edward Smith had come up to ascertain what had happened. In view of the uncertainty of being able to make this repair, the steep gradient ahead, and the probability of assistance being obtainable quickly, they decided that as soon as the guard had protected the rear of the train he should go back to Black Park signal-box and telephone to Ruabon for assistance. The guard returned to his van, and was still in the van, having just got out his detonators, when the collision occurred. Meanwhile signalman Richards of Black Park signal-box had telephoned to signalman Edwards of Llangollen Junction box about 4.01 a.m. to ascertain if the Oswestry train, which had passed Black Park at 3.50 a.m., had yet passed out of section, as the usual time was nine minutes and he knew the following (Oxley) train was approaching his post. Signalman Edwards stated that he did not reply to the telephone message, but thought that the Oswestry train must have passed him and that he had forgotten to clear it, and forthwith signalled “Train out of Section” to Black Park. Signalman Richards at Black Park immediately asked for “Line Clear” for the Oxley train, and this was accepted by Edwards at Llangollen Line Junction about 4.02 a.m. The Oxley train was slowed at Black Park to almost a walking pace, but the home and starting signals were taken off just before the train reached them, and on the falling gradient the train regained speed and was travelling at probably 30-35 miles an hour when, on rounding the bend by Fron Branch Junction box, driver Hopkins saw the tail lamps of the Oswestry train some 300 yards ahead. He immediately shut off steam and made a full application of the vacuum brake (which was sufficiently violent to throw guard Williams on to the floor of the rear brake van) and opened the sanders, but was unable to stop his train before it struck the rear of the Oswestry train at a speed which must have been about 10 miles an hour. 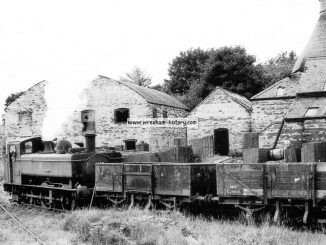 It appears that the engine of the Oxley train drove the rear of the Oswestry train forward for a distance of some 90 yards, forcing two of the wagons right across the up line, demolishing some 20 feet of the para-pet on the up side, and breaking up other wagons, which subsequently caught fire from the stove in the guard’s van. It is evident that the heavy stone parapet of the viaduct saved a number of the wagons from being thrown over the side. It also appears probable that the existence of the check rail saved the engine of the Oxley train from being diverted to any appreciable extent from the track, as although the leading pair of wheels were torn off, the coupled wheels and the tender wheels remained close to the line of rails, the coupled wheels coming to rest on the right-hand side of their respective rails, while the right-hand tender wheels were in between the check rail and the running rail which had been burst apart for some 70 feet and the left-band tender wheels were on the left-hand (or outer) side of their rail. (c)The fact that the rear of the Oswestry train was not protected by detonators in time to warn the driver of the Oxley train of the obstruction. (a) Unfortunately it has been impossible to find the missing cotter, which may have been thrown out to the side of the line some distance back, or may possibly have dropped on the track about the point of the collision and been cleared off with the debris. The end of the valve spindle in question is 3 1/2 inches long, tapering from 1 5/8 to 1 1/2 inch diameter and should be a driving fit into the socket. When it is fitted the correct fit to full depth is checked by putting a mark of wet paint at the bottom of the socket and verifying that this is picked up on the end of the spindle. The spindle is then secured by a tapered cotter about 2 1/2 inches long by 1 1/4 inches wide by inch thick. This is driven through from above in a. direction slightly inclined from the vertical and secured by a split pin underneath. The valve gear in question was dismantled for periodical workshop inspection at Birkenhead two days prior to the accident. 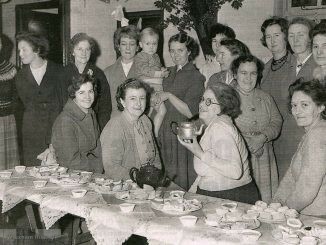 It was found to be in good condition and examining fitter Thomas stated that on reassembling be distinctly remembered inserting a new split pin and opening it. Driver Johnson stated that, while inspecting and oiling prior to starting the journey in question, he felt the cotter and split pin in position, and he was quite certain that all was’ in order. The valve gear was inspected after the accident and it was reported that the spindle was a trifle loose in its socket, and such looseness might have led to the cotter working out in case of the absence of the split pin. It is, of course, possible, but I think unlikely, that the split pin was sheared off as a result of the cotter tending to work loose, but in view of the coincidence of the valve gear having been dismantled only two days previously, I cannot but think that it is more probable that the split pin was not sufficiently opened and that it worked out, thus releasing the cotter and causing the engine failure. He then assumed that the train must have passed his box and reached Ruabon, and that Ruabon had cleared back, while he had forgotten to do so. He did not look at his train register or take any other steps to check his idea that the train bad passed him without his seeing it, but forthwith gave “Line clear” to Black Park for the Oxley train. The main responsibility for, the accident must rest upon signalman Edwards He has a total of 26 years of railway service, 20 years as a signalman and 10 years at Llangollen Line Junction box, and has a good record. Llangollen Line Junction box is a small box containing 24 working levers; the train movements past the box between the hours of midnight and 6 a.m. average about twelve in each direction. The last train to pass was a light engine on the up road about ten minutes before the accident. It would appear to be a serious case of failure to observe the elementary principles of block working. (c) As regards the absence of protection in rear of the Oswestry train after it had come to a standstill, it appears that there was a period of not more than eight to nine minutes between the time the Oswestry train came to a standstill and the time of the collision. Taking into consideration the fact that the guard had to go up to the engine, make .a. decision with the driver about calling for assistance and then return to his van to get his detonators, I am satisfied that there was no undue delay, in carrying out the regulation for protection. In this connection it is satisfactory to note that, after the collision had blocked both roads, the personnel :of both trains exhibited promptitude and resource in giving warning of this ; guard Smith, though injured and dazed by the collision, going, forward immediately to make certain that the up line had been protected by the two firemen, while guard Williams of the Oxley train, who was injured also, went back and broke into the closed signal-box at Fran Junction so as to get into communication quickly with the signal-boxes on both sides. It is probable that this collision would have been averted if there had been some means of rapid communication such as a code of whistles or lamp signals whereby the engine driver could have intimated to the guard that the situation required him to go back to protect his train forthwith, thus, saving the time taken in walking to and from the engine, and it is suggested that the Company should consider the practicability of establishing such a code signal for use in similar emergencies. The circumstances of the accident draw attention to the value of heavy parapet walls or similar protection on viaducts and bridges minimising the results of accidents which may occur in such situations. I have the honour to be, Sir, Your obedient Servant, A. C: TRENCH, Colonel. The Secretary, Ministry of Transport.